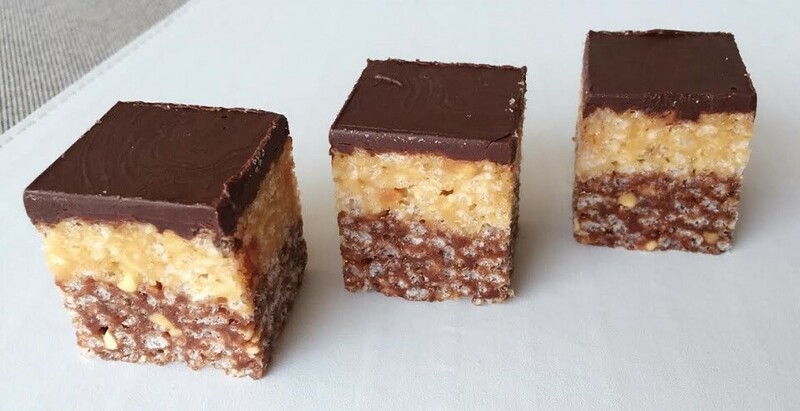 With puffed rice, peanut butter and chocolate, the kids will absolutely adore crunching this scrumptious slice as an afternoon tea treat. Plus it’s perfect for you if following the 28 Day Weight Loss Challenge. Add 1 ½ cups of puffed rice to one bowl and the other 1 ½ cups of puffed rice into a second bowl. Add your cacao/cocoa to the remaining peanut butter mixture, stir through then mix it into the second bowl of puffed rice. Grab your lined pan and add one bowl of puffed rice mixture to pan. Press firmly into the base (and we really do mean FIRMLY). For best results really take some time with this step. Add the remaining bowl of puffed rice mixture over the top and once again, press firmly so it sticks together. Remove from fridge and cut into 18 squares with a sharp knife. Recipe makes 18 pieces at 124 calories per serve. Store in an airtight container in the fridge.